The Law of Attraction Money Challenge is Nearing its End. It's Day 15. The Goal: To Manifest an EXTRA $ 500 in 21 Days by Doing One Exercise Suggested here Everyday. Have you been following the $500 law of attraction challenge since Day 1? If yes, I want to thank you. I would really not have been so committed to this challenge, had I not written about it here. Thanks, indeed. So well, let’s come back to today. It’s day 15. What the heck did Jason say today? Apparently, when I would convince myself that I didn’t know anything about money, my negative beliefs about money would vanish. So I would notice their not being there! Jason wanted me to clearly see what beliefs I had had earlier which were not there now – now that I didn’t know anything about money. 1 Convince myself that I knew nothing about money. 2 Notice what beliefs were NOT there when I knew nothing about money. This activity would make me more aware of my money beliefs. Now the first thing to do was to actually imagine that I didn’t know anything about money. You see, despite yesterday’s exercise I still freaking thought I knew a lot about money! So I had to really do something to feel like a ‘money-dumbo’. What to do…..? All of a sudden, I got this idea: let me imagine that I was a kitten. Kittens don’t know anything about money. I imagined that I was in the garden in front of my house under a park bench. 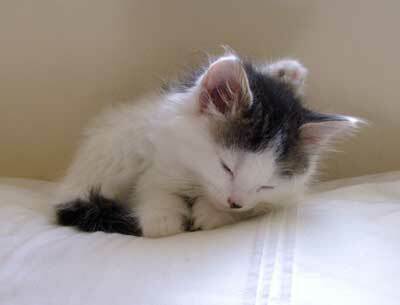 I curled up like this kitten here: comfortable and cozy. And I looked at the world around me…..There was a “huge” man walking nearby but I let him be. I was used to such men. So that’s what I did. I slept. Without a care in the world. When I woke up, I felt hungry. So I stretched my little paws and yawned. I shook my little head. And then I looked around. There…there was a sparrow jumping about in the mud. Slowly….slowly….I adjusted my stance. I crouched low..and moved on tip toe….and in a flash I pounced on the sparrow finishing it off with one blow. Then I brought it back to my under-the-bench luxury residence and savored it for a while. As a kitten, I was free to spend my time as I wanted – without being supervised by a boss! How amazing that I didn’t have to spend all day earning money. .. I noticed another thing: money didn’t matter. The notes didn’t matter. Rs 100 or Rs 1 million didn’t matter. I imagined a Rs 100 note placed before me. I picked it up with my paw and tore it into shreds. What did matter was my desire. When I wanted food, I’d get it. When I wanted to play kitten-hunts-mock-sparrow, I would play it! When I wanted to sleep I would sleep! Those were my desires. And they mattered. What didn’t matter was gathering loads of paper. It seemed absurd to spend time making money. And not focusing on desires. Obviously, I am still attached to money, but seeing the world through the eyes of a kitten did make me see money in a lighter vein and not give too much importance to it. What matters truly, is what you desire – not money, I felt. To make my manifestations total $500, I need $ 69.70 more. And there are 6 days left in this law of attraction money challenge. Could happen. Q: Why a kitten and not a cat? A: Because I love cute little kittens. Q: Who taught the kitten hunting? The Law of Attraction Challenge: $500 Manifested! The Law of Attraction Challenge: Day 7 It Is!